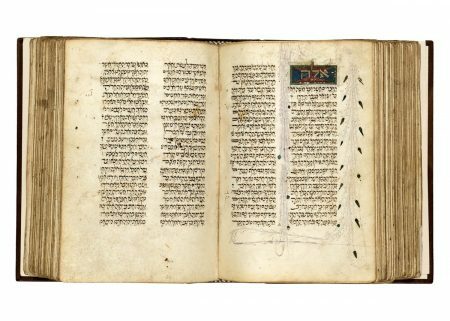 This manuscript with the full text of the Pentateuch and haftarot (weekly readings from the Prophets) does not contain a colophon, although the scribe may have alluded to his name by marking the names Moses and Aaron when they appear on folio 58v. The volume’s semi-cursive Sephardic Hebrew script and codicological features point toward a Sephardic origin of the second half of the fifteenth century. The biblical text and the partial Masoretic notes apparently do not contain any relevant irregularities; a more precise identification will have to depend, therefore, on the decoration. The manuscript contains six illuminated initial word panels found at the beginning of each of the books of the Pentateuch, and at the heading of the haftarot. The letters of the initial words of the five books are executed in burnished gold leaf, outlined with black ink, set in a panel divided into four compartments of red and blue, decorated with filigree designs, framed in green. The word panel for the heading of the haftarot has detailed purple pen work only. Elaborate, mostly floral, purple pen flourishes, embellished with flowers and gold dots, fill some of the marginal spaces of the pages on which the initial word panels appear. Especially striking is an imaginative human face, which appears as part of the purple pen-work decoration on folio 52r. Christie’s Amsterdam 1989, lot 128; Metzger 1977; Schrijver 2003, p. 182; Sed-Rajna 1970, esp. plates XLIX and LXIX.